Admittedly, it's way early. But we've just past the All-Star Break and before we know it, the season will be drawing to a close. With the spring wearing on, clubs across the US and Canada will be ending their seasons. And with that, the amateur tryouts will begin. For those who are new to the league this season, the American Hockey League allows players who have reached the end of their major junior or collegiate seasons to sign amateur tryout contracts or ATOs. Many times these players are already under contract to the NHL affiliate and other times they are just promising kids who went undrafted. These players don't count against the club's Clear Day roster and don't have burn a year of their NHL contract by playing. It is often a great way to get a jumpstart on their professional career. Players currently on the Stars who started on ATOs include Jack Campbell, Austin Smith and Taylor Vause. So, here is a way-too-early preview of the players Texas could expect this season and when. Ritchie is a prospect that Dallas Stars fans have been watching closely this season. Early in the season he compiled an eight game goal scoring and ten game point scoring streak. Despite disappointment in losing to the Russians in the bronze game at the World Juniors, Brandon Worley heaps praise on the young winger. He is 6th in the league in goals (28) and 21st in points (52). He is a gaudy plus-25 to boot. The IceDogs are currently in sixth place and look entrenched to make the playoffs. Texas got Jack Campbell early last year when his club missed the playoffs. Niagara does not appeared poised to do that. They will play their final regular season game on March 16th. Playoffs will begin after that. The AHL season will continue until April 20th this year. ATOs can be added in the AHL playoffs as well. However, they are unlikely to play much since the teams will have more on the line. Winkler is a lesser-known prospect for Stars' fans. Drafted in the third round in 2009, he hails from Norway, a relative rarity in the NHL. Only eighteen players have been drafted from Norway. In 26 games this season, he has 11 goals and 12 assists. The center Winkler plays at Colorado College and will be ending his four years of NCAA eligibility after this season. Colorado College was also home to former Stars Richard Bachman, Scott McCulloch and Stephen Schultz. Colorado College has a losing records this season and will likely be done with hockey first among these three teams. The WCHA has a year-end tournament to which all teams are invited. Seeding would place CC at a disadvantage and they would likely be out in the first round. Based on rankings, CC is unlikely to be invited to the NCAA Tournament as well. The only way they could be would be if the team won the WCHA tourney and became the league's automatic qualifier. The WCHA wraps up its tournament on March 23. 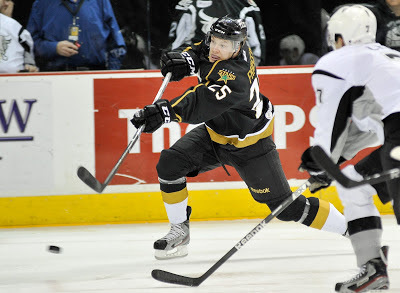 Curtis McKenzie was a sixth round pick in 2009 out of the Penticton Vees, where he played with Austin Smith in 2007-08. He had an impressive final season in the BCHL (30-34-64 in 53 games), which likely led to his choice on the draft board. He, like Austin, went the NCAA route. McKenzie joined up with the Miami Redhawks, the same club as Reilly Smith. McKenzie is third on the club in scoring this season with 7-9-16 in 23 games. The Redhawks have only lost four games this season and currently rank fourth on the NCAA Division I Men's Hockey Rankings. They will likely go to the NCAA Tournament and compete there for a national championship. That game is on April 13th in Pittsburgh, which is the latest McKenzie could be involved for the Redhawks. Alright, last one, I promise. Jamie Oleksiak and Antoine Roussel were recalled by Dallas today. On a four game winless skid, the Stars are looking to shake things up. Texas has enough bodies now to facilitate the callup as well. The Texas Stars, proud American Hockey League affiliate of the Dallas Stars, announced today that Dallas recalled defenseman Jamie Oleksiak and center Antoine Roussel from Texas. Dallas also announced that left wing Reilly Smith has been returned on loan to Texas. Oleksiak, 20, leads all Texas Stars defensemen in scoring with 23 points (3 goals, 20 assists) in 43 contests this season. The Toronto, Ontario native recently played in the AHL All-Star Game in Providence, R.I. where he earned the game-winning assist and a plus-3 rating in the contest. The 6-foot-7, 254-pound defenseman was Dallas' first-round selection (14th overall) in the 2011 NHL Entry Draft. Should Oleksiak make his NHL debut while being called up, he will be one of seven players in the League listed at 6-foot-7 or taller. 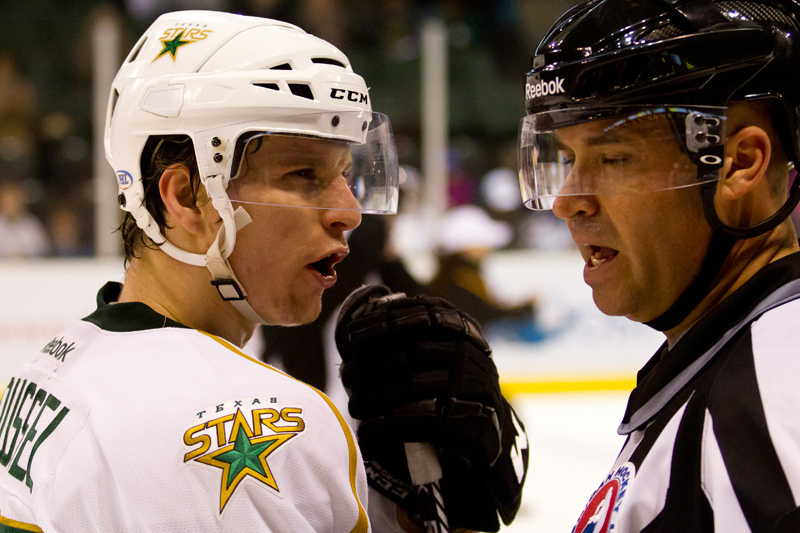 Roussel, 23, ranks seventh on the Texas Stars in scoring with 19 points (8 goals, 11 assists) and leads the team with 103 penalty minutes. The Roubaix, France native is looking to make his NHL debut and become the eighth French-born player to skate in an NHL contest. Roussel, who has already set career highs in goals, assists and points this year, was undrafted and signed by Dallas as a free agent on July 2, 2012. Smith, 21, has gone scoreless in six games for Dallas this season and is still looking to earn his first career NHL point. Prior to being recalled by Dallas, the Toronto, Ontario native skated for the Texas Stars where he currently ranks second on the team in scoring with 25 points (11 goals, 14 assists) in 37 contests this season. Smith was Dallas' third-round selection (69th overall) in the 2009 NHL Entry Draft. The Dallas Stars are expected to announce this afternoon that they are assigning winger Reilly Smith to the Texas Stars. Smith, who was called up for NHL training camp and has played in six NHL games this season, has zero points and two PIMs with a minus-1 rating in the NHL. In the AHL, meanwhile, Smith is a gargantuan force, scoring 25 points in just 37 games. Despite 3 weeks out of the AHL, Smith is still the Stars #2 scorer behind Matt Fraser. Smith will continue to boost an ailing forward corps for Texas. The Stars now have options at forward with the additions of Smith, Sceviour and Fyten. 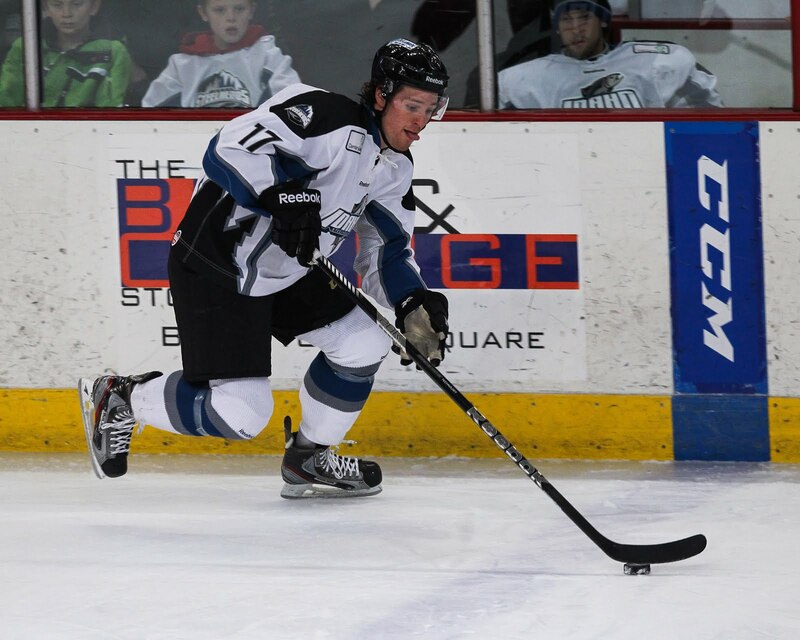 Meanwhile, with Bachman and Nilstorp both in Dallas, Texas recalled Tyler Beskorowany from the Idaho Steelheads in a separate transaction. Nilstorp is on the injured reserve in Dallas and the timetable for his return is currently unknown. "Besko" will get the backup gig behind Jack Campbell, who will have to step up to run the show in the absence of Nilstorp or Bachman. Hundred Degree Hockey has learned late today that forward Austin Fyten will be joining the Texas Stars on a professional tryout contract (PTO). Fyten was in camp with Texas and has spent the season in Idaho. Through 43 games, he has 14 goals, 26 assists and a plus-17 rating. 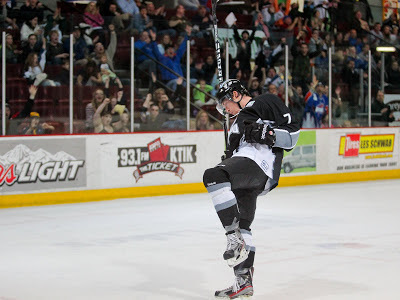 The first year left winger out of the ECHL has 22 points in the last 14 games for Idaho. The forward will join Texas at an opportune time for both, as injuries in Dallas and Texas have hampered the club from icing a full complement on their forward lines. Texas dressed no more than eleven forwards for several games prior to the All-Star Break. Fyten's agent, Manny Schmidt, told Hundred Degree Hockey that he had three different PTO offers on the table yesterday and selected the Texas Stars. Austin chose Texas because he had a "very high level of comfort with the organization, management and coaches based on attended camp there." He also had the opportunity to "rejoin several players that he already has some chemistry with and experienced some success with in Idaho." This is a great move for Texas GM Scott White and the club in general. It is surprising that it took this long for Fyten to get a shot in the AHL overall. After the Chaparral Ice on I-35 closed its doors in January 2012, there was a new hope on the horizon. As previously reported here, the Pond Hockey group has been working to open a smaller 'pond hockey' ice sheet close to the current Chaparral location at Northcross. At last estimate, it was due to open this month. 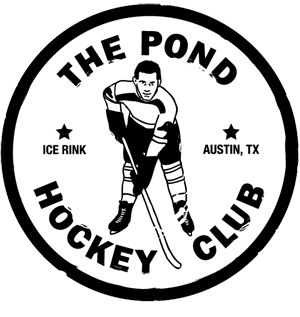 I caught up with Pond Hockey Club GM Jerry Taylor this week to ask him about the progress of the project. The City of Austin has had an across the board work slowdown that is affecting both residential and commercial permitting processes. Taylor reports that the group is in the demolition phase of the current interior structure and will begin construction soon thereafter. The previous floorplan was a 140' long ice surface, but changes to the plan will add ten more feet. These floorplan changes will also allow for a mezzanine level above the locker rooms, additional off-ice training space, a skatemill, and even synthetic ice for shooting and stickhandling practice. The group can work for six weeks before they will need approval from the city to move forward on the section affected by the new floorplan. Taylor hopes to have the rink open at the beginning of May. 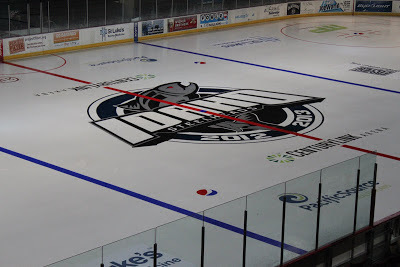 The Idaho Steelheads came out of the All-Star break with a three game road trip to the east coast as they took on the South Carolina Stingrays (Providence Bruins) and the Gwinnett Gladiators (Rochester Americans). King did not make the trip to Utah to take on the Grizzlies (Abbotsford Heat) back on Jan 21 and once again stayed home for the trip out east with an injury. He has not yet been placed in an IR spot, so I am imagining there is an outside chance for him to be back in the lineup this coming weekend. Since the New Year he has a record of 4-1-1-1 including a 51 save night against the Utah Grizzlies and a brief call-up to the AHL earlier this month. Since the New Year he has a record of 2-3-0-0. He hasn’t seen as much ice time as he did at the beginning of the season, but that is more due to the re-emergence of Tyler Beskorowany as the goaltender that was a contender for ECHL Goaltender of the year 2 seasons ago. Notes: With the Dallas Stars putting Cristopher Nilstorp on the injured reserve list and calling up Richard Bachman from Texas, one of these two goaltenders are going to get the call to provide back-up for the Texas Stars. If I had to guess, I would lean a touch towards Robinson getting the call, due to the organization wanting to see if he has what it takes to advance to the next level. Either way, the positive for the Steelheads is that one of these goaltenders will still be on the roster and will see the ice just about every game. The Steelheads made their first trip to South Carolina in their history and the first time that they played the Stingrays since the 2003-04 season when the Steelheads won their first Kelly Cup Championship. Patrick Cullity was just reassigned to the Steelheads from the Springfield Falcons of the AHL and his presence was immediately felt on the power play as he assisted on the first goal of the game as well as the eventual game winner. Ian Watters and Andrew Carroll got credit for those two goals. Sam Carrick and Austin Fyten scored the other two Steelheads goals. Tyler Beskorowany continued his strong play as he turned aside 37 of 40 shots en route to the win. The Stingrays were able to put 17 shots on net in the first, but Beskorowany turned all of them aside. A late power play goal by the Stingrays in the third period (2 seconds left) made the final score 4-3. The Steelheads hopped on a bus for a four hour ride for the second of three consecutive games and the first of two in a row against the Gladiators. Josh Robinson would get the start for the Steelheads and would play well enough to win; however, he would end up with a tough luck loss as the Gladiators would capitalize on a late power play to earn a 3-2 win. David Towes and Andrew Carroll provided the offense for the Steelheads. Once again the Steelheads allowed 40 shots against and once again Steelheads goaltender Robinson turned aside 37 of them. The Steelheads had to work a little overtime on Sunday in order to walk away with four out of six points on the weekend. 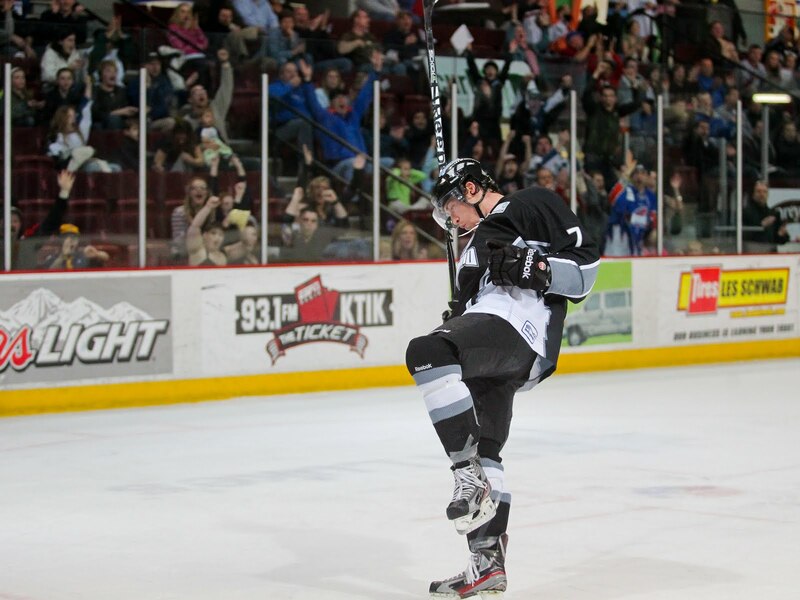 Andrew Carroll got the game winner in overtime as the Steelheads defeated the Gladiators 6-5 in OT. Beskorowany was back in net and was able to turn aside 30 of 35 shots against. Austin Fyten, Ian Watters, Ben Ondrus, Sam Carrick and James Isaacs scored the five other Steelheads goals en route to the win. By getting 2 wins and 4 out of 6 points the Steelheads record now stands at 27-11-1-4 which is good for 59 points and 2nd place in the Mountain Division and 3rd place in the Western Conference. The Steelheads trail the Alaska Aces (independent) by 8 points for the Division lead, and lead the Stockton Thunder (Oklahoma City Barons) by 7 points for 3rd in the conference. The Steelheads continue on the road this upcoming Friday and Saturday as they travel to Stockton to take on the Thunder with a chance to put a strangle hold on 3rd place in the conference. With a Saturday victory over San Antonio pushing them into first place, Texas is sitting pretty at the All-Star Break. However, it's about to get a whole lot tougher. Coach Desjardins is definitely pleased with where his Texas Stars sit at the end of January. After a season that saw the club miss the playoffs and finish second to last in the league, being in first place at the All-Star Break is a nice accomplishment. "It's nice to be in first. That was our goal: to make the playoffs. The more points you can get the better because their hard to come by after [the Break]. That certainly doesn't guarantee anything, but it's good to have those points." The Stars aren't going to take any time to rest on their laurels. This is a club that has a top power play, but a near league worst penalty kill. They have been scoring a lot of goals recently but have also been allowing a few more than they'd like. "There's lots of things to improve. It's so much harder to win after the All-Star Break. The lockout had a lot of guys shuffling around, and teams haven't gotten things back together a little bit. Just like we aren't totally in sync, other teams aren't either. Teams will start getting back in sync here." 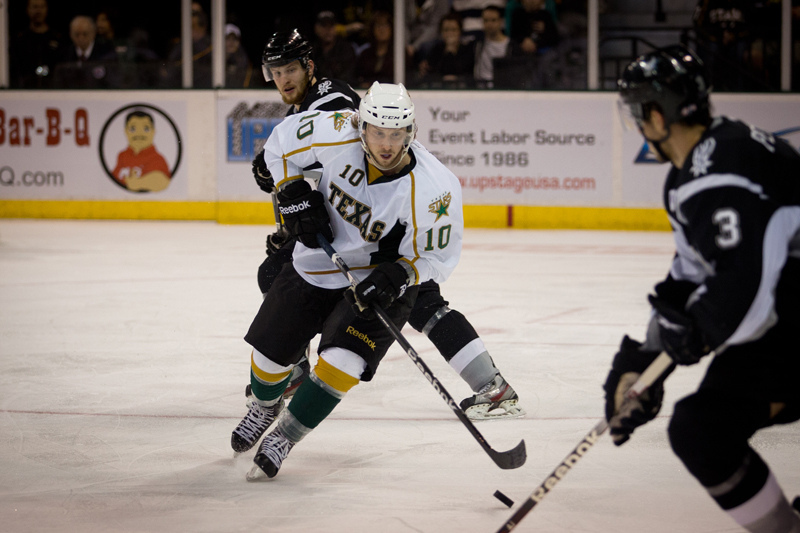 Dallas announced this afternoon that they are returning Colton Sceviour to the Texas Stars. Sceviour got into one game while in Dallas, earning his first NHL assist on a Ryan Garbutt goal. This helps Texas greatly on the numbers side, if nothing else. Texas has been skating no more than eleven forwards in their past few games. The Texas Stars, proud American Hockey League affiliate of the Dallas Stars, announced today that Dallas has reassigned winger Colton Sceviour to Texas. Sceviour, 23, has been recalled to Dallas twice this year. The Red Deer, Alberta native made his 2012-13 NHL debut last Saturday at American Airlines Center against the St. Louis Blues, recording his first career NHL point with an assist on Ryan Garbutt’s third period goal. In 32 AHL games with Texas this season Sceviour has a plus-10 rating and 24 points (11 goals, 13 assists), which ties him for third on the team in scoring. He was Dallas' fourth-round selection (112th overall) in the 2007 NHL Entry Draft. The playoffs are just around the corner for the AHL. For the fourth year now, the Hundred Degree Hockey playoff projections page is back. This is the same format as last year's, as very little has changed. You can access the spreadsheet by choosing the "Playoff Projections" page in the right-side navbar or by clicking here. I have added an FAQ and tried to demystify more of the formulas. If you have more questions, ask them and I will answer them and consider adding them to the FAQ. Note, for example, that in this year's first edition of the projections the Wolves and Devils slip from 10th and 11th place respectively and into the top 8. They have a lot of games in hand on the teams around them. Matt Fraser won the accuracy shooting competition on Sunday and had a goal in Monday's All-Star Game as the Western Conference swept both events for a second straight year. Jamie Oleksiak was game-high plus-3 and had an assist on the game-winning goal. Fraser's goal came early in the first period off a breakaway pass from Milwaukee Admiral Victor Bartley. The second-year All-Star tucked it just inside the left post past first period East tender Niklas Svedberg. Late in the game, the East captain and captain of the hometown Providence Bruins, Trent Whitfield, tied things up at six all. Down to the final twelve seconds, Toronto's Ryan Hamilton would complete his All-Star hat trick to win the game 7-6. Oleksiak was out for the final shift and generated the scoring attempt with the keep at the blue line and pass to OKC's Arcobello. In the previous evening's Skills Competition, Matt Fraser won the accuracy competition for the West, knocking out four targets in five attempts. Jamie Oleksiak, who shot for the West in the hardest shot competition, did not have any shots recorded as he missed the net in both attempts. The Dallas Stars announced two moves this morning as the entire AHL moves into the All-Star Break. First, due to the injury of Cristopher Nilstorp last night in Dallas, the Stars have recalled Richard Bachman. Bachman will backup Kari Lehtonen on Monday. Nilstorp was officially placed on the injured reserve this morning, which makes him ineligible for game action for seven days. Texas will not look to recall a backup for Jack Campbell immediately, since the Steelheads have a game today and Texas doesn't play again until Friday. Additionally, as the Stars are now overstocked on defensive bodies, the club sent Jace Coyle back to the Idaho Steelheads. The addition of Carl Sneep made this move possible. The Steelheads will really appreciate the help, currently skating a forward on defense to make ends meet. Justin Dowling scored his first professional hat trick to power the Stars 4-1 victory over the San Antonio Rampage tonight in front of a sellout crowd. "The bounces were all going my way tonight. I gotta give all the credit to my linemates. We've really been clicking.," said Dowling. "The crowd was going wild, and the fans were behind us." The final game before the All-Star Break for both teams saw Texas jump out to a two goal lead off even-strength goals from Dowling in the first. San Antonio cut the lead in the second but Dowling answered on the power play to complete the trick. Richard Bachman got the start at home, stopping 25 of 26 overall. The win gives Texas two points to push them past the Checkers and into first place in the West at the break. Coach Desjardins is happy with where they are but knows the road is long ahead of them: "The more points you can get before the All-Star Break the better. It's so much harder to win after the All-Star Break." Dowling started his night at the 11:45 mark of the first period. A slick pass from Mike Hedden found Dowling all alone in front of the net. "The first one was just an unbelievable pass by Hedden," said Dowling. "I just faked the shot, tried pulling it [back] and waiting him out. He left upstairs open, and I was able to tuck it in." In the dying second of the first, Dowling got his second. "On the second one, I was looking to pass to Hedden, but the defenseman took him away. I thought about going upstairs but got it under his glove." Up 2-0 after one, Texas was also pummeling the Rampage on shots 15-8. The Rampage would get one back in the second as Greg Rallo found Casey Wellman unmarked in the left wing circle, where he slapped it home past Bachman for the 2-1 score. The power play goal would be the only tally of the night for the Rampage, however. Dowling completed his hat trick in the third as a shot from Maxime Fortunus ping-ponged in front of the net and was tapped home by the young winger. Hats rained down from the sellout crowd. "[Dowling's line] is a good line," said Desjardins. "Chiasson has played really well for us and has stepped up since the end of the lockout for us as a leader. Hedden scored 19 goals in this league last year. He's talent and can play well. They seem like a good fit." After forty, Texas locked it down as they tend to do. The Rampage sent 13 shots at Bachman, but he turned them all aside. San Antonio would pull Markstrom with just over a minute and half left in the game. Toby Petersen sealed the deal in the final thirty seconds with an empty net goal. Antoine Roussel and Matt Fraser assisted on the goal. The point for Fraser extended his point streak to nine games. Bachman had nothing but praise for the team in front of him after the game: "This group has a ton of character. I saw it in Peoria; I saw it in Rockford. Also, they're unselfish. The pass to Petersen at the end: most guys would have shot that." Texas now takes a break as the league celebrates the All-Star Game in Providence. The Stars will next be in action on Friday, February 1st at Houston. * - Texas dressed 18 skaters tonight but did not play defenseman Jace Coyle for a single shift. As a result, he was removed from the gamesheet after the contest. Tonight's attendance was 6,863. This was the Stars' first sellout of the season. UPDATE: Dallas recalled Colton Sceviour this morning. 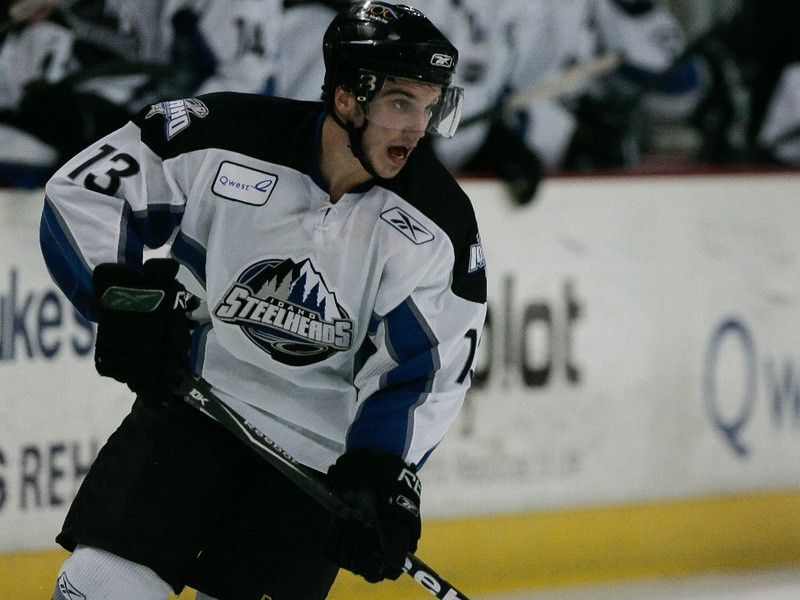 The Stars have added forward Bretton Cameron on a PTO out of the ECHL's Greenville Road Warriors. Texas returns back to the Cedar Park Center for the first time in a while looking for some revenge after last night's loss in San Antonio. The Rampage got a phenomenal performance out of their goaltender, Jacob Markstrom, and scored just enough to edge out the Stars in overtime. The win last night was San Antonio's first over the Stars this season. The Stars will likely trot out only eleven forwards tomorrow night as well. Luckily for Texas, the Rampage are equally hobbled due to callups and injuries. Texas is going to need better than a one goal effort to guarantee a win against the Rampage. After scoring twenty in their previous three, the Stars only got one in last night's. It was a reversal of fortune for sure, but not one that was unexpected. The Rampage usually have the opposite problem that they did last night. That is, they are great on defense but have trouble scoring goals. Texas has had trouble keeping the puck out the net recently, but it hasn't mattered because they've scored so much. Point is that the Stars just flat out need to score goals and preferably the first one. The Rampage seem to be a team that can self-defeat and deflate if faced with early adversity. Texas needs to hound on that by scoring early (and often, if possible). Sixty minutes would not be enough for these two clubs as has been the case so many times in the past. Tonight, it was San Antonio coming out on top. Tyler Sloan collected his first goal of the season but a power play tally from Jon Rheault in the OT period sealed the deal for San Antonio's first win over Texas this season. With the single point earned, Texas will maintain its first place ranking in the Western Conference. Richard Bachman had 25 saves on 27 shots. Matt Fraser extended his scoring streak to eight games with an assist in the second. San Antonio struck first just over a minute into the game. Texas claimed early puck possession off the faceoff, but the Rampage charged back down the ice and generated a 3-on-1 opportunity. Jonathan Hazen found twine on the Rampage's first shot of the night, beating Bachman on the short-side top shelf. The Stars outshot the Rampage 12-8 in the period and were down 1-0 after the first. Texas and San Antonio played throuhg a mostly quiet second period, matching up evenly on shots through the full twenty minutes. However, Tyler Sloan made some noise late in the period to tie things up. Off the rush, Sloan collected his first goal as a Texas Stars, going top shelf on Markstrom with a slick backhand move. Matt Fraser extended his point streak with the primary assist on the goal and Colton Sceviour collected a point in his first game back with the secondary assist. The Stars and Rampage traded power play opportunities back and forth in a chippy third period, but neither team could score. Each team collected a point for the tie after sixty and went to overtime. Jacob Markstrom was splendid early in the OT, robbing Toby Petersen of a solid opportunity in the first few. Alex Chiasson took a hooking call with less than two minutes left in the OT. Jon Rheault, the top scorer for San Antonio, pounced on a loose puck in the crease to seal the Rampage's first win over Texas on the season. The two clubs will face off tomorrow at the Cedar Park Center. Both teams only iced 17 skaters in the game. 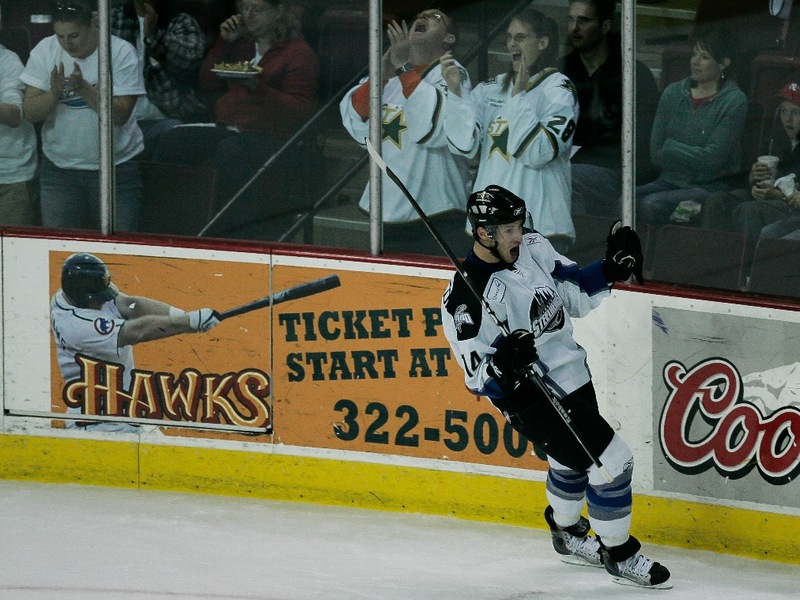 The Steelheads came home this past weekend to take on the conference-leading Alaska Aces (unaffiliated). Friday night was exactly what the doctor ordered. This was the first game since the NHL lockout ended where the Steelheads were facing another team in the same situation as they are. The Bakersfield Condors (unaffiliated) managed to survive with very little roster turnover; the Aces, on the other hand, lost five NHL players. Idaho jumped out to a 2-0 lead when newly acquired Tyler Gron scored his first goal of the night only to be followed up by Brett Robinson just 51 seconds later. Anyone familiar with the Alaska/Idaho rivalry knows that no lead is safe, but it’s better to play from ahead. Especially when Alaska’s Sean Curry would make it a 2-1 game, just 27 seconds after Robinson’s goal. That’s where the first period would end. In the 2nd period, Idaho’s All-Star Austin Fyten took the game over netting two goals for the Steelheads in the first 2:41 of the period for a 4-1 lead. But once again the Aces would get a goal to make it 4-2. This time it was Alexandre Imbeault with the goal at 4:10 of the second. However, the Aces would pull no closer as David Toews, brother of Jonathan, and Tyler Gron would add two more goals to Idaho’s total as they went on to win 6-2. On Saturday night, the Steelheads once again jumped out to a lead when Matt Case scored just 2:48 into the 1st period. However, Alaska’s Mike Baran and Alex Hudson would score to give the Aces the advantage until the 18:30 mark of the 1st period when Brett Robinson would tie the game up at 2 as the teams headed to the intermission. The teams would trade goals in the second as Zach Harrison would give the Aces a 3-2 lead, only to have Tristan King answer for the Steelheads to send the game to the 3rd tied at 3. This was a game where the Steelheads should have at least gotten a point out of it, as they played a good team game. There was nothing spectacular about either team, but the Steelheads deserved a slightly better fate. The Aces would get a late power play, and Nick Mazzolini was able to find a very weak spot within the Steelheads penalty kill box. With plenty of time to pick his spot after receiving a centering pass, he made no mistake, and the Steelheads would fall 4-3 to split the weekend series. After a quick turnaround the Steelheads would have a rare day game in Utah to take on the Grizzlies (Abbotsford Heat). The Grizzlies have been a thorn in the side of the Steelheads for the better part of the last year and a half. With Tristan King and Adrian Foster not making the trip due to some injuries, it appeared as if the Steelheads were poised for an “explainable” loss. The newly reassigned Tyler Beskorowany would have something to say about that before all was said and done. The two teams would trade the first 4 goals of the game as Austin Fyten and Gron got the Steelheads goals, and 46 seconds into the 2nd period the game was tied at 2. Ian Waters would put Idaho up 3-2 at the 6:23 mark of the second and Gron would get his second of the night at 9:51 to make it 4-2. Utah would make it 4-3 before David deKastrozza would get an empty net goal for the 5-3 final. As mentioned though, Tyler Beskorowany earned his first star for the game. After the Steelheads outshot the Grizzlies 13-11 in the first period, the Grizzlies would outshoot the Steelheads 43-11 through the remaining TWO periods. “Besko” would end up with 51 saves on 54 shots as he bailed out his team countless times late in the 3rd period. This coming weekend the Steelheads travel into the Eastern Time Zone as they play the South Carolina Stingrays (Providence Bruins) on Friday and face former Idaho Steelhead training camp attendee Ryan Zapolski. Zapolski was a casualty of Texas sending both Beskorowany and Josh Robinson down to Idaho at the beginning of the season. He has also seen some time in the AHL and was named the ECHL All-Star game MVP. After Friday the Steelheads hop on a bus for a weekend set of games against the Gwinnett Gladiators (Portland Pirates). The Gladiators currently sit second in their division and 4th in the conference. The Steelheads did get some good news Thursday as the Springfield Falcons of the NHL announced that Patrick Cullity has been assigned back to Idaho after playing 6 games with the Falcons. Cullity will be a welcomed addition to the Steelheads defense which has struggled a bit since the NHL/AHL call-up madness that happened a couple weeks ago. Cullity’s stat line with Idaho this season: two goals and three assists in 22 games played with 24 PIMs and an even rating. The Stars return to the state of Texas tonight, but they aren't quite home yet. Texas will play their final game of the road trip in San Antonio. On the trip, they've gone 4-1 and are hoping to go 5-1 with a win over the Rampage. 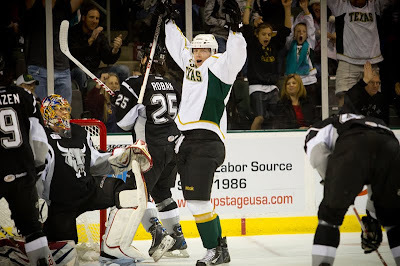 Texas and the Rampage have matched up five times so far on the season and the Stars have won every game. San Antonio's recent home success will be standing in their way, however. The Rampage have won seven of their last nine at home after losing seven straight. San Antonio play-by-play man Dan Weiss adds that injuries and roster depletion are weighing heavily on the club. He puts Scott Timmins at still questionable. 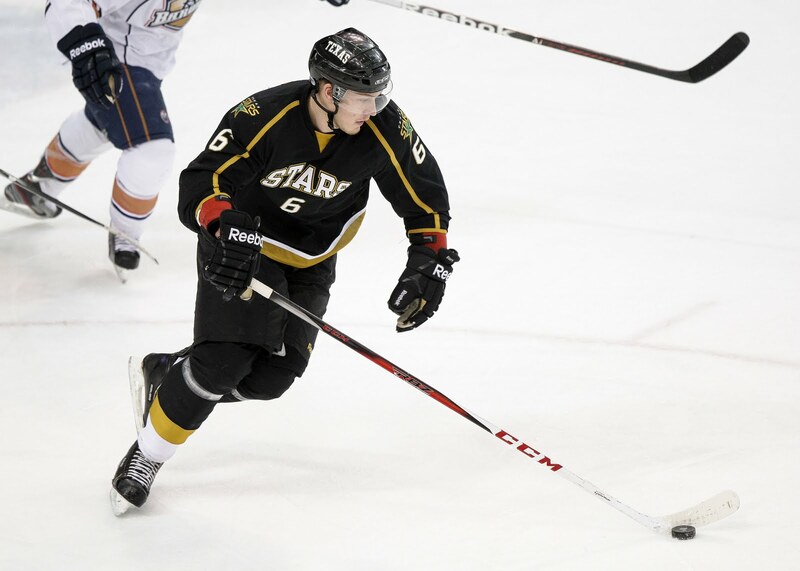 Leading scorer against the Stars, Drew Shore, has been recalled to the Panthers and Michael Caruso was called up and then promptly broke his arm. Nathan Mallett adds that the Rampage are only dressing one 'natural' centerman at the current juncture, Jared Gomes. Gomes has zero points against the Stars in four games but fourteen points on the season overall. Rallo and Wellman are listed at center, but neither has played center this season. Making matters worse, the Rampage lost James Wright to a waiver claim by the Jets. The Stars will likely trot out Richard Bachman for one of these two games. Fans surely hope it's the Saturday game at Cedar Park Center. Bachman has a 5-3-1 all-time record over the Rampage. It's time to remove Eakin, R. Smith, Benn and Dillon from the call-up list. Based on their performances so far this season, I think it's unlikely they will be returning. Dallas swapped Tomas Vincour in for Sceviour on their roster today. Sceviour made the NHL opening roster but did not make it into any contests over the past week. Texas is still one forward short for tomorrow's game. 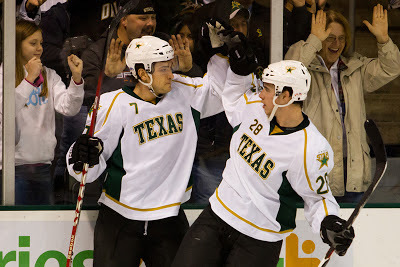 The Texas Stars, proud American Hockey League affiliate of the Dallas Stars, announced today that Dallas has recalled right wing Tomas Vincour and has returned forward Colton Sceviour to Texas. Vincour, 22, has skated in 39 games for Texas this season earning 19 points (7 goals, 12 assists) with a plus-4 rating. Now in his third season with the organization, Vincour has posted five goals and seven assists, totaling 12 points in 71 games in the NHL. He comes to the Stars after playing three seasons in the WHL, where he earned over 35 points in each of his campaigns. The 6-foot-2 forward is one of only six players born in Brno, Czech Republic to skate in an NHL contest and one of only two to earn over 10 career points. Vincour was Dallas' fifth-round selection (129th overall) in the 2009 NHL Entry Draft. Sceviour, 23, did not skate in any contests while being recalled by Dallas. He returns to the Texas Stars tied for the team lead in game-winning goals (3), tied for third in plus-minus (+9) and tied for fourth in scoring with 23 points (11 goals, 12 assists). The Red Deer, Alta. native was Dallas' fourth-round selection (112th overall) in 2007. In early news this morning, the Dallas Stars have acquired Wilkes-Barre/Scranton Penguins defenseman Carl Sneep from the Pittsburgh Penguins organization. Sneep was selected by the Pittsburgh Penguins in the second round of the 2006 NHL Entry Draft, 32nd overall. Sneep was traded for a conditional pick in the draft. He was immediately assigned to the Texas Stars after the trade. Sneep will ensure experienced defensive depth. He is in his third year and has 102 games played with four goals and 23 assists. Texas needed the depth after losing Jordie Benn and Brenden Dillon to the Dallas Stars, likely both for the season. It's a good thing for them, but leaves Texas in a lurch. Max Fortunus, Tyler Sloan, Jamie Oleksiak, Patrik Nemeth, Gord Baldwin, Jace Coyle and Hubert Labrie were your remaining defensemen. Texas alternated between Labrie and Coyle being the scratch this past week, but was clearly not 100% on either. "[He is a] third year guy, not a liability by any means. He was just shuffled out of the system by the lockout / pedigree first year D-men. He was injured last season, upper body, and that plagued him this season getting shuffled out. He was temporarily sent to Wheeling to get games." The biggest news out of this trade is that it happened at all. Texas needed something to maintain their success, and Dallas made a move to help them out. That is a sign of a healthy ownership group in Big D and a health relationship between Texas GM Scott White and Dallas GM Joe Nieuwendyk. Case in point, if you look back to last year, San Antonio got Jon Matsumoto thanks to a trade by the Panthers. That trade had no benefit to Florida but they made it to help their farm club. With solvent ownership, GM Joe can follow Dale Tallon's example and make the right moves to help both Dallas and Texas. Success now from the farm club ensures that the prospect in the system grow and mature in a winning environment. Sneep should be in the lineup this weekend against San Antonio. Texas may have broken their six-game win streak, but it was the only game they lost this week as some new faces stepped up to fill the void and they climbed into a tie for first place in the AHL. 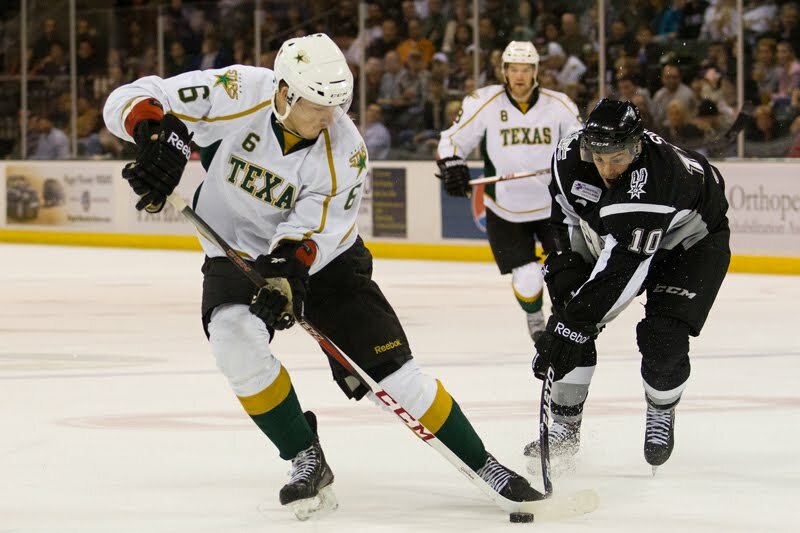 The Texas Stars are moving ahead quite nicely this week despite the absence of some of their top players. After dropping the first game of the week to the Chicago Wolves (Vancouver Canucks), the Stars rattled off three straight wins, scoring a total of twenty goals across the games. It's a little delayed, I admit, but back when we thought Cody Eakin was playing his last game in Texas, January 6th, I asked him to reflect on his time here. I think he shows great character with his short quote. "It's been a great series of events. Getting trading here and having an opportunity to play a lot of minutes. It's a young group of guys. We were a little tentative at the beginning of the season, but if you look at us now, we can face the best teams in the league. We've grown together. It's been half a year but it feels like a lot longer than that. Whatever happens in the next week, it'll be a new challenge. We've come a long way since the first few games and it's been a lot of fun." Eakin's experience in the AHL certainly helped in earning him a spot on the second line in tonight's game at Joe Louis Arena. Down three goals in the second period, the Stars put together six unanswered goals, including three power play goals, to win 6-3 in Rockford this afternoon. The Stars got points from their big contributors as Matt Fraser, Tomas Vincour and Antoine Roussel all had a goal and an assist. Alex Chiasson had a goal and Jamie Oleksiak and Toby Petersen picked up two assists each. Richard Bachman stopped 29 of 32 shots against in the game. The two points moved Texas into a tie with the Charlotte Checkers for first place in the entire AHL at 55 points overall. The Stars have won nine of their last ten as well. The first Rockford goal came just as the Stars were coming off a penalty kill. Jeremy Morin's fourteenth of the year made it 1-0 early and was definitely generated by the power play, despite not counting as one. Jimmy Hayes went next with back-to-back goals for the Hogs. On his firs,t the puck went in, rainbowing over Bachman on a rebound effort by Hayes on the power play. As the second period began, Hayes got his second on the breakaway, beating the Texas D to set the score at 3-0. 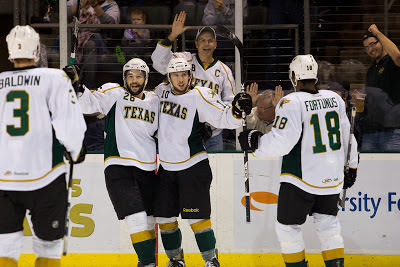 Texas was also down to Rockford 3-0 in their last game, additionally with two goals by Jimmy Hayes. The Stars began to mount their comeback in the second period. Tomas Vincour went first, going upstairs on Kent Simpson off the faceoff. Matt Fraser assisted on the goal to extend his scoring streak to seven games. Just over a minute later, Alex Chiasson popped in a goal off the pass from Jamie Oleksiak to make it 3-2 for Rockford. Then the power play stepped up. Texas would score three straight on the power play to scorch Kent Simpson and the Hogs. Maxime Fortunus drew first blood on the man-advantage with a blast from the point, assisted by Petersen and Hedden. Texas went to the second intermission with the score tied at three. The onslaught continued in the third period with the 5-on-3 power play taking center stage. Justin Dowling completed a beauty cross-crease pass by Jamie Oleksiak for the go-ahead goal, his second goal of the season. Roussel added insult to injury on another power play with a solid backhander insurance goal to make it 5-3. Luke Gazdic and Tomas Vincour assisted on the play. Matt Fraser collected his twentieth goal of the season with an empty net goal in the dying minutes of the game to make it 6-3. Texas now returns home for the next few days before heading down to San Antonio on Friday to play the Rampage. The Stars find themselves in Rockford, Illinois, for their first day game of the season. With many schools out for MLK Jr Day, the arena should be unusually full of kids getting the day off. The IceHogs are coming off an 11-6 loss to the Grand Rapids Griffins, which garnered national attention for the bench-clearing brawl that occurred in the second period. THe full game sheet is here, and it is not pretty. Puck Daddy even reported on the fracas, which included a goalie fight. The Stars will look to continue their recent goal scoring ways against the IceHogs. Texas has put up fourteen goals in two games this weekend. That effort raised their average goals per game by two-tenths of a goal, from 2.64 to 2.85. Speaking of goals, Richard Bachman certainly had to be happy to be assisted by the best offensive effort the Stars have had all year. In his first game action since April 7th, 2012, he allowed four goals on 34 shots. He should get the start again today to make sure that he is ready to head back to Dallas in the coming week. The timing of that switch is currently unknown. The Stars have gotten nice offensive efforts from skaters sliding in after Eakin, Sceviour and Reilly Smith headed to Dallas. Alex Chiasson has five points in the last two games. Austin Smith collected his first and second AHL goals this weekend and Matt Fraser is on a six game point streak. Patrik Nemeth is even getting into the action with two assists and a plus-5 rating on the weekend. Texas ranks third in the league on the power play after starting the season near dead last. If the Stars are looking for a place to improve, they know the penalty kill needs work, especially with some of their top killers in Dallas. The numbers on the PK look worse than they are however. Texas has been disciplined this season, giving up the 6th fewest shorthanded opportunities in the league. However, they have allowed quite a few of those to turn into goals. Their ranking (26th) is skewed by how few opportunities they've given up, despite the fact they are midpack on PP goals allowed on the whole. The Stars used a season-high four goal first period to power their 6-4 win over the Wolves tonight in Rosemont. Texas got two goals from Alex Chiasson and three assists from Jamie Oleksiak. In addition, Austin Smith collected his first career AHL goal in the first period. The six goal team effort was also a season high. Jack Campbell had 27 saves on 31 shots in the game. The win broke up a four game win streak for Chicago and moved Texas to within two points of the Charlotte Checkers, who were idle tonight. Texas's gargantuan first period started early with two goals in twelve seconds during the second minute of the game. Alex Chiasson went first, collected a Mike Hedden pass out of the corner and banging home a second effort past Matt Climie. Just twelve second later, Austin Smith had his first career AHL goal off a centering pass from Taylor Vause. Smith, at the top of the crease, set the score at 2-0 before many had found their seats. The onslaught continued as Chiasson had his second of the night on a beautiful dangle around Andrew Gordon. The backhand goal was his ninth of the year and was assisted by Gazdic and Oleksiak. Toby Petersen chased Matt Climie from the net with his third of the year. The backhand shot off the pass from Oleksiak came just before the fourteen minute mark. With Joe Cannata in net, Texas ceded a power play goal during a Justin Dowling holding call. Andrew Gordon tipped a Brad Hunt shot past Jack Campbell. The frenetic first came to an end with Texas ahead on shots 12-6 and in goals 4-1. Things only cooled off a bit in the second period with the teams combining for three goals. Chicago went first as Mike Davies got his fourth of the year, tipping a Darren Haydar shot from the point to make the score 4-2 Texas. Mike Hedden would re-establish the Stars three goal lead on the power play halfway through the period. Hedden's shot fell into the net behind Cannata as Alex Chiasson wildly swung at the puck, attempting the hat trick. The rubber needed no help to tally Hedden's second of the year. Chicago finished the period with a round the net backhand goal from Haydar on a seemingly harmless play. After forty, Texas was set at a 5-3 lead. In the third, Texas traded goals again with Chicago. Taylor Vause surprised Cannata with a turnaround shot through the five hole for the 6-3 marker. Darren Haydar turned right around and scored off a tip from an Andrew Gordon shot. Texas will bus overnight to Peoria to face the Rivermen tomorrow night. UPDATE: Vancouver returned eight today. Uncertain if they'll be in the lineup: Andrew Gordon (RW), Anton Rodin (F), Bill Sweatt (LW), Darren Archibald (LW), Derek Joslin (D), Joe Cannata (G), Kevin Connauton (D) and Peter Andersson (D). After getting run by the Wolves on Wednesday, Texas gives it another go tonight. The loss on Wednesday broke up a six-game winning streak and a streak of eleven games with a power play tally. The Stars were severely shorthanded, skating only ten forwards and six defenseman. Among skaters, the Stars only got one player back from Dallas today. AHL All-Star Jamie Oleksiak was returned and could be in the lineup tonight. If that is the case and no one comes off injury, Texas would likely play a defenseman at forward and double shift someone from the top lines onto the fourth. Vincour would be most likely to return, but there was no indication early today if he would play. 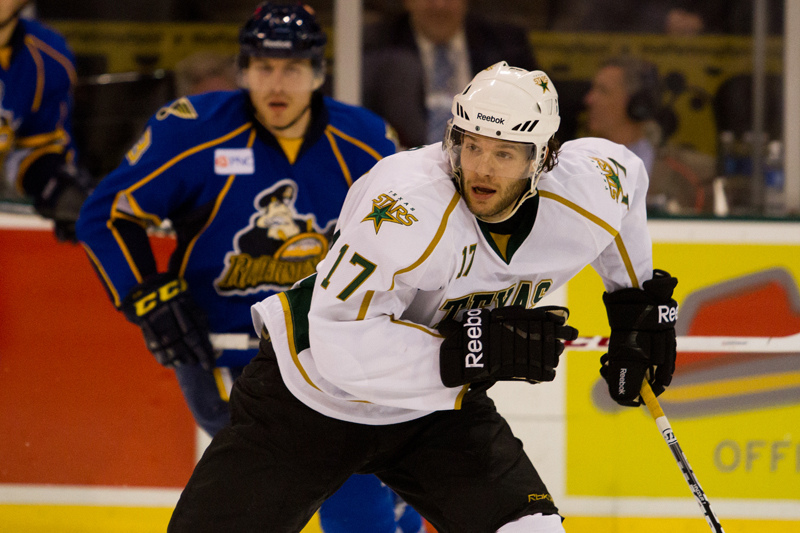 The big news that Stars' fans should get excited about is the return of Richard Bachman. The former Texas Star will return for a few games to get back in 'game shape', as he will not have the luxury of a preseason schedule. With back-to-back games and another on Monday, it is possible that Bachman could get all the starts he needs while Texas is on the road and never be seen at the Cedar Park Center. Texas needs to contain the top talent in Chicago. The Wolves haven't added or subtracted any players of note since Wednesday. That means Texas should concentrate on containing Brett Sterling and Darren Haydar, the Wolves leading remaining scorers. Texas Stars forward Matt Fraser and defenseman Jamie Oleksiak have been named to the Western Conference AHL All-Star team. For Fraser, it is his second selection for the honor after being selected last season in his rookie year. Oleksiak, a rookie, is going for the first time. The All-Star game and festivities will be held this year in Providence, RI, on January 27-8. Fans are now called upon to select the starters from the roster given, which you can do here. This year marks the second time Texas has had two players named to the All-Star squad. In 2010, Brent Krahn and Ivan Vishnevskiy were named. Only Vishnevskiy played, as Krahn was injured. Travis Morin was selected in 2011, but Francis Wathier played in his place due to callup. Matt Fraser was the Stars lone selection in 2012. 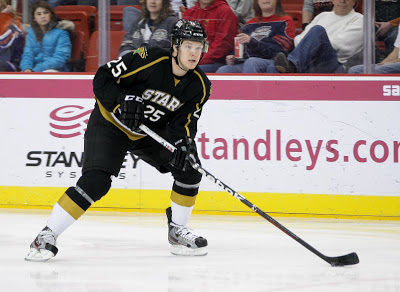 The Texas Stars, proud American Hockey League affiliate of the Dallas Stars, announced today that left wing Matt Fraser and defenseman Jamie Oleksiak have been selected to represent the Stars and the Western Conference at the 2013 Dunkin’ Donuts AHL All-Star Classic in Providence. Fraser, 22, leads the Stars and ranks fourth in the AHL in goals (18) and is tied for the league lead in power play goals (9). The Red Deer, Alberta native has 22 points (18 goals, 4 assists) and a +7 rating in 39 games played and is one of only two Stars players to appear in every game so far this season. Fraser will be making his second consecutive appearance at the AHL All-Star Classic after playing for the Western Conference All-Stars at the 2012 AHL All-Star Classic in Atlantic City. Oleksiak, 20, has skated in 38 games for Texas this season, recording 17 points (3 goals, 14 assists) and a plus-6 rating. The 6-foot-7 Toronto, Ontario native was Dallas’ first-round selection (14th overall) in the 2011 NHL Entry Draft. Oleksiak is currently called up with Dallas for the Stars’ NHL training camp. 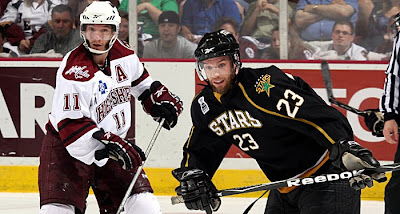 The AHL announced the two full rosters of the 2013 AHL All-Star Classic Thursday. Each team comprises 24 players: 13 forwards, eight defensemen and three goaltenders. Rosters were determined by committees of AHL coaches, and all 30 AHL teams are represented by at least one All-Star. The 2013 squads feature 33 first-time AHL All-Stars, 12 rookies and 12 former first- and second-round draft choices. Luke Richardson of the Binghamton Senators and Jon Cooper of the Syracuse Crunch will coach the Eastern Conference All-Star team; Dallas Eakins of the Toronto Marlies and Jeff Daniels of the Charlotte Checkers will guide the Western Conference club. Beginning Friday and until Jan. 24, fans will have the opportunity to vote for the starting lineups for the 2013 AHL All-Star Game by visiting facebook.com/theahl and completing the official CCM AHL All-Star Fan Ballot. Voters will also be entered to win prizes of a team-signed 2013 AHL All-Star stick (two) and team-signed 2013 AHL All-Star commemorative programs (10). Severely depleted by the on-going NHL training camps, the Texas Stars fell tonight to the Wolves at the Allstate Arena by a 4-1 score. Texas only dressed sixteen skaters in the game. The loss breaks the Stars franchise-record winning streak at six games. Brett Sterling collected two goals for the Wolves on the night. 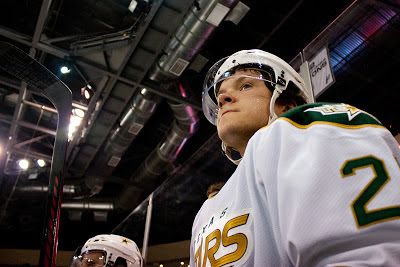 Matt Fraser had the Stars' lone goal. Jack Campbell took the loss, stopping 24 of 27 shots. The Wolves and Stars skated to a scoreless first period as each team only managed seven shots in the period. Both clubs had trouble getting their offense going as the clubs worked to size up not only each other but also themselves. Chicago got on the board in the second period as Brett Sterling picked up his fourteenth goal of the season. The tally was originally unassisted but was corrected to give an apple to Darren Haydar. The assist was Haydar's fifth his last four games. The teams traded power plays in the period as Chicago outshot Texas 11-6 in the frame. Brett Sterling collected another goal in the first few minutes of the final period. The puck popped over Gord Baldwin's stick at the point and Sterling was off to the races. Just inside the right faceoff dot, the left winger went blocker side on Campbell. The Wolves poured on the shots in the third period with the Stars not registering a shot in the period until the midpoint of the frame. Stefan Schneider collected his first goal of the year with seven minutes left in the period to make it 3-0. He broke in unimpeded to beat Campbell. In the dying minutes of the third, Matt Fraser continued a streak of his own, scoring for a fourth straight game to break up Matt Climie's shutout bid. Texas would pull Jack Campbell to attempt to close the gap. Chicago would add an empty net goal in the final minute to seal their win. Texas stays at 49 points with the loss. The Stars will likely stay in fourth place however due to the separation they created during the win streak. They will stay in the Windy City to meet the Wolves again on Friday. Texas only iced sixteen players tonight, six defenseman and ten forwards. Texas officially announced the recall of Mathieu Tousignant today and added in the signing of left wing Joey Martin, out of the ECHL's Toledo Walleye. Martin, a second year player, had eight games in the AHL last year with Houston. He scored two goal in that time. Both players are expected to be available tonight against Chicago. The callups are necessitated by the recall of Colton Sceviour and Jamie Oleksiak to Dallas. Neither travelled with Texas to Chicago. 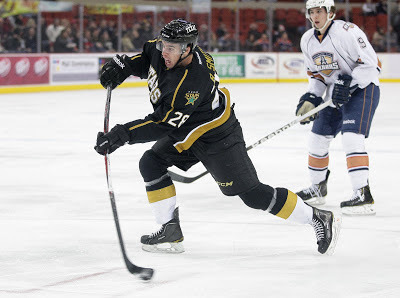 The Texas Stars, proud American Hockey League affiliate of the Dallas Stars, announced today that center Mathieu Tousignant has reassigned by Dallas to Texas from the Idaho Steelheads of the ECHL. Texas also announced that left wing Joey Martin has signed a professional tryout contract and has been called up from the Toledo Walleye of the ECHL. Tousignant, 23, returns to Texas after playing in 28 games for the Steelheads, recording 19 points (4 goals, 15 assists) and 77 penalty minutes. The St. Etienne-de-Lauzon, Quebec native attended the Stars’ AHL training camp and made the opening night roster, playing in the season opener on October 13th at San Antonio. 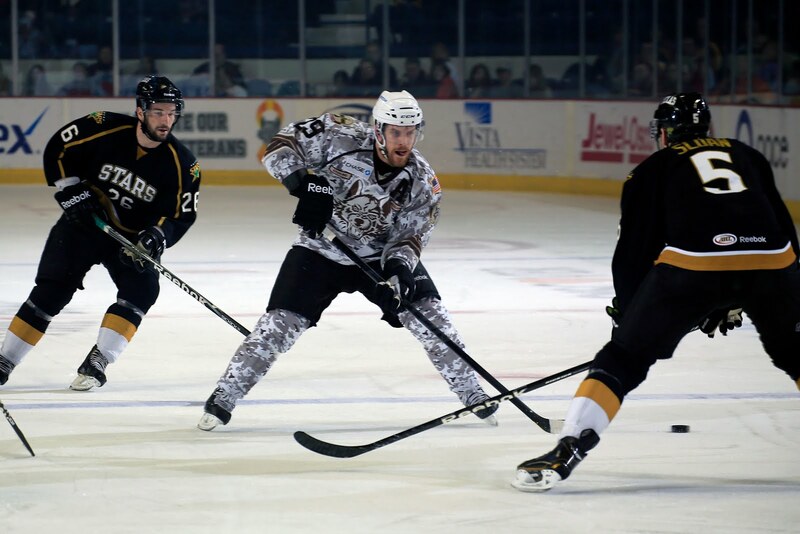 Tousignant (pronounced TOO-sihn-yeh) was reassigned to Idaho on October 23rd. In 159 career AHL games, all with Texas, he has 37 points (16 goals, 21 assists) and 214 penalty minutes. Martin, 24, has 19 points (6 goals, 13 assists) and 13 penalty minutes in 29 ECHL games for Toledo this season. The Thorold, Ontario native is in his second full professional season and made his AHL debut during the 2011-12 season with the Houston Aeros, playing eight AHL games and registering two goals. 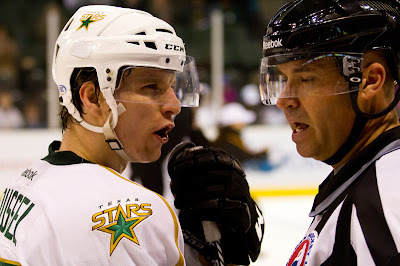 While playing for Houston, Martin faced Texas once last season, coming to Cedar Park Center on January 21, 2012, a game the Stars won 4-3 in a shootout. Martin (5-foot-10, 185 lbs.) played four years of NCAA Division I college hockey for the University of Nebraska-Omaha, where he scored 103 points (39 goals, 64 assists) in 152 career NCAA games. The Texas Stars kick off the second half of their 2012-13 campaign in the Windy City for their first game of the season against the Chicago Wolves. Formerly division rivals, the Stars and Wolves will only play each other four times this season. Both games at Allstate Arena will be played this week. It is an interesting time for the Vancouver Canucks affiliate. If you look at the skaters list, there are a lot of red Xs next to names at the top of the list, indicating callup to the NHL. According to the AHL transaction sheet, the Wolves had 12 players recalled to the big club this week: Andrew Ebbett (C), Andrew Gordon (RW), Anton Rodin (F), Bill Sweatt (LW), Chris Tanev (D), Darren Archibald (D), Derek Joslin (D), Joe Cannata (G), Jordan Schroeder (C), Kevin Connauton (D), Peter Andersson (D) and Zack Kassian (RW). If you check that list, three of the top four scorers are out and potentially not returning. Among the top five, the only ones that remain are Brett Sterling (13-13-26, plus-9 in 30 GP) and Darren Haydar (5-14-19, plus-7 in 29 GP). Players still remaining to watch for include Brad Hunt, a rookie defenseman with 2-14-16 and a plus-5. The Stars are likely to see Matt Climie in net. He has been the starter in all but one game since November 28th, a stretch of 16 games. Eddie Lack has been hampered by a groin issue in that time. The former Star Climie is on an AHL-only deal and has a 9-11-1 record with a 2.41 GAA and .921 SV%. Texas should look to continue their power play success against the Wolves, one of the worst clubs in the league at 79.5% (28th). The Stars have scored a power play goal in eleven straight games, including their last contest against OKC which featured a depleted roster. The Wolves are struggling this season overall. They are currently on a winning streak of three games and have piled up two four games streaks as well. Those wins account for eleven of their seventeen. The Stars are also going streaking in a winning way. Tonight's game represents a chance to extend a franchise-record winning streak to a seventh game. If Texas can survive the first, a period they are being outscored in 28-36 on the season, they have a great shot at the win. Texas is 7-2 when leading after one and 11-1-2-2 when tied. The NHL usually does a pretty good job with heartrending commercials. Maybe you've seen this recent commercial from the NHL. How about that tag line? #hockeyisback? If hockey is back, to quote Jason Chaimovitch, what have I been doing for the last four months? You want to talk about a 'meditation on perfection'? How about Barry Brust, a goaltender without an NHL contract by the way, snapping the AHL's record for longest shutout streak this season. Brust played three consecutive shutouts, breaking a 55 year-old record and setting a new one at 268:17 of flawless play. You want to chat about 'dedication'? How about all the guys who gut it out in the ECHL and CHL for league minimum? In the ECHL, that comes to just over $12,000. Can you personally live on $380 a week? Add to that travel by bus and, in the AHL, regular three games in three nights... Turns out you can manage, if you're playing the best sport in the world for a living. 'Unwavering faith in the incredible'? That's simple: USA 3, Sweden 1. 'Games aren't meant to be seen; they're meant to be felt.'? Three million fans have 'felt' AHL hockey in person this season. Do you think they're confused about hockey being back? What did countless season ticket holder die-hards do over a dozen times since October? Was that not hockey? Add to that the accolades and accomplishments of dozens of leagues that I didn't mention here, not the least of which are Canadian Juniors and the NCAA. Make that a team-record six in a row for the Texas Stars. On the final game of their weekend three-in-three, the depleted Stars stretched their win streak to six games with a 3-0 victory over the Barons this afternoon in Oklahoma City. Texas has achieved five-game win streaks four times before, thrice in 2009-10 and once in 2010-11. Jack Campbell picked up his first shutout of the year with 36 saves in the game. Texas got it done on the power play with Matt Fraser scoring his seventeeth of the year. With the goal, the Stars have now scored a power play goal in eleven straight games. Colton Sceviour added the insurance goal in the third. Matt Fraser's power play goal was the only marker of the first period. With Andrew Hotham in the box for delay of game, Jamie Oleksiak found Fraser to beat Olivier Roy. Toby Petersen, sliding into that unit in replacement of Travis Morin, collected the second assist. Texas would be outshot in the period 7-5 but go to the locker room up 1-0. The Stars played a very quiet second period. There were no goal or penalties int he middle frame as OKC outshot Texas again by a mark of 11-6. Toward the end of the period, Campbell was tested multiple times by the Barons offense but came up solid on all bids against. When leading after two periods, Texas has a 15-0-0-0 record. Tonight was no exception as the Stars extended the lead on their first shot of the period. Jace Coyle found Colton Sceviour on a nice outlet pass, setting Sceviour free to go forehand-backhand on Roy and score his eleventh of the year. Coyle's assist was his first AHL point of the season in his first game back. 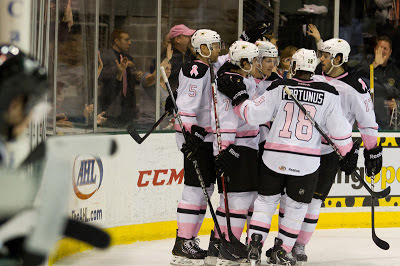 The Barons continued to pour it on, outshooting the Stars 18-5 in the period overall. Texas stood tall with major saves down the stretch from rookie goalie Jack Campbell. Tomas Vincour collected a late ENG to make it 3-0. The win sets Texas's win streak at six and moves them to 49 points on the season. The Dallas Stars officially announced their callups today for training camp. In total, six players were recalled from the Texas Stars, but they were not the six you would expect. 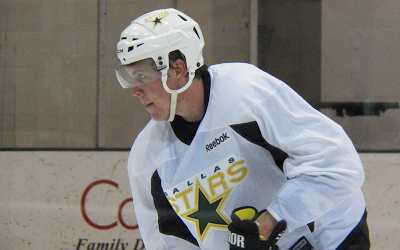 Dallas recalled Cristopher Nilstorp, Brenden Dillon, Jordie Benn, Cody Eakin, Reilly Smith, and Antoine Roussel. Eakin, Dillon and Benn were known to be going to camp since a week ago. Discussion through the week made it obvious that Nilstorp was going. Reilly Smith is an obvious choice given the stretch he has had over the last two months. The surprise here is the inclusion of Antoine Roussel and the exclusion of Tomas Vincour. It's surprising at first, at least, but if you look at the numbers, perhaps it isn't. Vincour started the season on the first line with Eakin and Reilly Smith but was slowly demoted down the ranks until he was playing third line minutes. His production dropped and he wasn't showing the same play that earned him callups last year. Vincour can be a dominate player at the AHL level, if he wants to be. Perhaps some sense of 'I'm going up anyway when this lockout is over.' got the best of his motivation. Meanwhile Antoine Roussel has been outpacing expectations. The third year forward has already set career highs for goals (7) and assists (8) while also racking up 101 PIMs. Roussel has been able to effectively draw calls for the Stars and consistently find the scoresheet. He is a player in the mold of Steve Ott but at a lower price tag for now. This means all six players will be unavailable for today's game against the Barons. UPDATE: Late note here indicated the Barons can expect to lose Teemu Hartikainen, Magnus Paajarvi, Colton Teubert and Yann Danis today, in addition to the big four mentioned below. It's the Barons again. Or is it? With camps starting today, the Barons of 2013 will not be the same as the Barons of 2012. Five of OKC's top six scorers are gone to Edmonton: Jordan Eberle, Justin Schultz, Taylor Hall, Teemu Hartikainen and Ryan Nugent-Hopkins. The only remaining top scorer is Mark Arcobello, a solid player but definitely a beneficiary of being on a line with some NHL talent so far this season. The Barons are winless since the departure of their big NHL talents. They have dropped three contests by a combined score of 17-6. The Stars are riding a five game winning streak into the Sooner State. It would be very easy for them to get caught looking past this game. With the above-mentioned subtractions and Dallas camp on the horizon, the Stars could lose their laser focus of the last few games if they aren't careful. Additionally, Texas is expecting to lose Cody Eakin, Brenden Dillon, Jordie Benn, Tomas Vincour, Reilly Smith and Antoine Roussel to Dallas training camp. Cristopher Nilstorp could also be among them. With the callup of Tyler Beskorowany yesterday, Jack Campbell should get the start today, and Beskorowany should back him up. As of this writing just before midnight on Saturday, NHL teams had only just been allowed ot start signing and trading players. This also extends to transactions. There should be a flood of them today. Watch the wire to see who goes. It was a copy and paste effort from last night to this night for Texas as they allowed the first goal and then no more in tonight's game again. After San Antonio scored early in the first, the Stars collected goals from Alex Chiasson, Jordie Benn and Matt Fraser to mark a 3-1 win and extend their winning streak to five games. "We get scored on sometimes early," said Benn. "But it doesn't affect us at all. We know it's sixty minutes. We just don't quit." Texas now has a 5-0 record against San Antonio on the season. "These points are huge against division teams. San Antonio's a big team, but we've been lucky keep them to one goal." San Antonio's only goal of the night came at the 6:31 mark of the first period. The rebound goal by Drew Shore was assisted by defensemen Nolan Yonkman and Colby Robak. Despite the Stars shots advantage through the period, 12-5, the Rampage were holding serve and playing well. The air came out of it for San Antonio in the final minute as Alex Chiasson scored off a beautiful drop pass from Reilly Smith. Smith broke into the zone and spun around to protect the puck, dropping it to a hard-charging Chiasson for his seventh of the year. Jordie Benn had the second assist. Benn would get one of his own on the power play in the second. With two in the box for holding and delay of game, Texas scored the eventual game-winner off the stick of Benn. "I just saw a little opening there. They always harp on us to shoot the puck, so I just shot it and it went in." The power play has been on the upswing for Texas recently as the one-time bottom ranked power play in the league is now top ten. The last time Texas failed to score a power play goal in a game was December 21st against OKC, a game the Stars won 3-0. "Our special teams really hurt us at the start of the year," said Coach Desjardins. "We were playing just as well but our special teams were losing us hockey games." The Stars capped off their sixty minute effort with a goal in each period. Their third period marker came from Matt Fraser, his team-leading sixteenth of the year. Fraser roofed a Sceviour pass over a diving Dov Grumet-Morris for the 3-1 score. Tyler Sloan picked up the secondary assist, his first point since returning from injury last game. The Stars now head to OKC overnight to finish the three-in-three. Charlotte's win over OKC kept Texas out of a tie for first place in the league tonight. The Stars have a game in hand over Charlotte, however. Coach on Dowling: "Dowling was good tonight. We know he's a skill player; I've seen him in the Western [Hockey] League. He'll improve; the pace of the league was a little faster than he's used to, but he'll get better and help us." Coach on Morin: "Morin is a little banged up. If he's healthy, he's playing. He's a real character player for us. He's just not quite ready, so we'll have to wait and see."